Heights and Bridges: Going Over the Edge! Here is a lovely picture of a big, tall, bridge. Now look up at the big blue sky over the bridge. 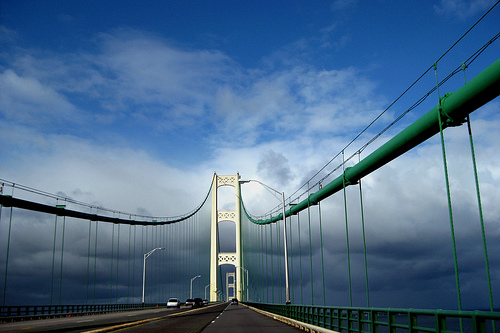 Do you see a woman’s head floating around in the big blue sky over the bridge? The head has dyed brown hair, eyeglasses and a mouth, wide open, screaming. The head belongs to a woman who is having an out-of-body experience. The rest of her body is driving (sort of) down there, on the highway on the bridge, three lanes north and three south. The woman’s body is driving south and her car is straddling the center and inside lane. Next to her car, in the outside lane, is a huge tanker truck. Way up in the sky, the woman’s head secretly thanks the tanker for blocking her view of the edge of the bridge. Bridges and their edges make her have panic attacks like she’s having now. The problem with having panic attacks on bridges and going 11 mph while straddling two lanes in a 50 mph zone, is sometimes other drivers get angry. They line up behind the woman’s car and honk or tailgate. Up in the sky, her head sees them banging on their steering wheels in total frustration, and she feels their pain. Her head tries to will her body to relax. “Breathe.” she commands her faraway body. “Count to ten. Sing! ‘The farmer in the dell. The f–ker in the dell. Hi ho…’” It’s useless. She can’t get enough air to get the words out. “This will be the day that I die,” she thinks. Meanwhile down in her body, her sweaty hands clutch the steering wheel. She prays that her hands won’t slip on the steering wheel and send her over the edge of the bridge. “Over the edge! That’s a funny one.” She’s already over the edge! Up in the sky, her floating head enjoys the irony. At last it’s over. As her car arrives at the end of the bridge and on to solid road, the woman’s head falls from the sky and reconnects with her neck and the rest of her body. She is spent. But she lies. She still drives on bridges, climbs mountain ledges, and rides up the old wooden rickety escalator at Macy’s to the 7th floor Woman’s Department. So, if you are in some high place, and next to you is a wacky pear shaped woman, introduce yourself. « Let’s Go Shopping, Pear Shaped People! It’s okay. That’s how I feel about those ‘flyovers.’ They are connectors from one freeway to the next that just hang out there in the air, at a tilt. I know, as well as I know my own name, that I am going to slide right off onto the lane of traffic below me. Traffic that is going 70 miles per hour. I’m wondering. Are you bothered more on sunny days? I find I do well on dark days. Therefore, I have come to the crazy conclusion that the bright lights and glare trigger some kind of wrong way synapse in my brain. Now, I truly sound like a wackadoo. Oh, I don’t do anything well on dark and cloudy days. I am a sunshine kind of gal. I also no longer drive at night unless it’s a route I know very well. If I had to do one of those flyover things at night, I’d just die. No, really, I would. Interesting. There goes my very unscientific hypothesis about sunshine setting off my crazy brain synapses. Of course, I realize there was one person in my research sampling, and, that, dear blogging buddy, was you.The variables we seem to share are that “I’d just die” thing that you describe. Oh, how well I know. Thanks for sharing.